Buffalo Wild Wings debuts new Mountain Dew-flavored wings as a tie-in to their sponsorship of the college football Citrus Bowl. They're calling the flavor "Zesty Citrus" sauce and it features the citrus flavor of Mountain Dew along with lemongrass and red pepper flakes for a sweet and spicy combination. Zesty Citrus Sauce will be available at Buffalo Wild Wings restaurants from December 14, 2015 through January 2, 2016. 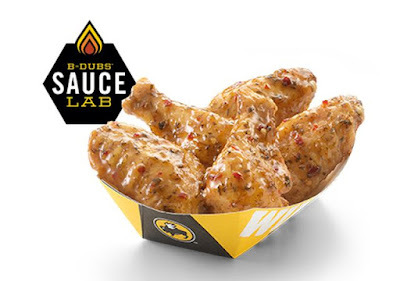 Fans attending the Citrus Bowl on January 1, 2016, can also purchase boneless wings tossed in either Zesty Citrus or Honey BBQ sauces at two Buffalo Wild Wings branded concession areas.